Variety: Carica l’Asino, Favorita, Sauvignon Blanc and Cortese Alto Monferrato. Vineyards: Town of San Marzano Oliveto, map 9, part 223. Pruning system is Guyot. Planted in the year of 1954. Working techniques in the vineyards: Pruning leaving 7/8 buds. Activities in the vineyardsare guided by a modern Biodynamic method, vineyards are certified organic by “Suolo e Salute”. Light straw-colored yellow, fresh and fruity scents. Light and balanced, perfectly acid and sapid. The story of this wine is very special and it starts in 2005 when the farm purchased a stable surrounded by vineyards, at a region called “Valle Asinari” (“Valley of the Donkeys”). These vineyards are grown and soon it is discovered the diversity of two parcels of Cortese Alto Monferrato. We’ve asked the previous owner, a nice vivid lady of 1922, that satisfied our curiosity. When her husband found out about this variety, “Carica l’Asino” (“Load the Donkey”), through their friends from Acqui Terme, they decided to grow it in their land at the region of “Valle Asinari” (Valley of the Donkeys”). 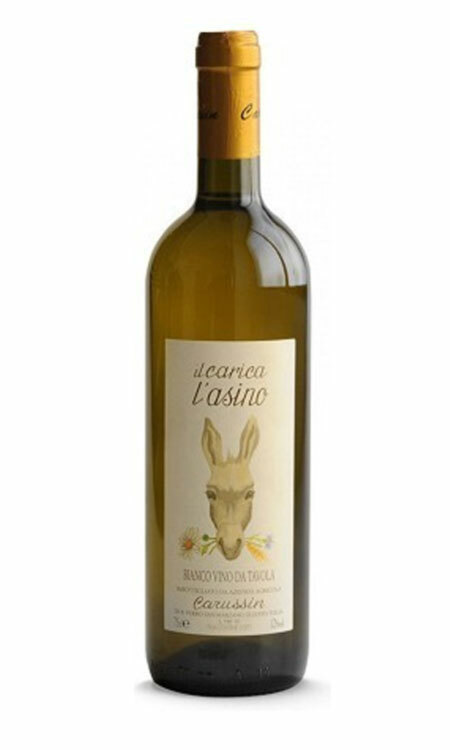 The curious existence of “Carica l’Asino” in that region combined with Bruna’s passion for Donkeys gave birth to the “Carica l’Asino” white wine. This wine has a longevity of 2/3 years. It is a still wine that goes well with appetizers, finger food and light dishes. Its curious sapidity sustains well sauces of first dishes. It is a pleasant wine of immediate taste.